Loading Ramps for Trucks, Vans, Box Trucks. 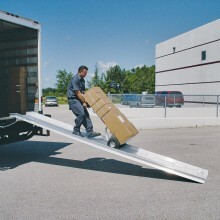 Aluminum Loading Walk Board Ramps. Heavy Duty Industrial Walkboard Metal Ramps. Complete setup for installing a pull out - telescoping aluminum walk ramp or a stand alone portable walk ramp with hook or apron with safety chains to load or unload a Semi, Van, Cargo, Truck or Trailer. Box truck loading ramps are made to order. Call with deck height, so we can determine the best lenght and load capacity for your new Aluminum Loading Walk Ramp. Intended for Two wheel hand truck use only. 8" Apron, 3 1/4" deep postion stop, 36" long safety Chains Included. 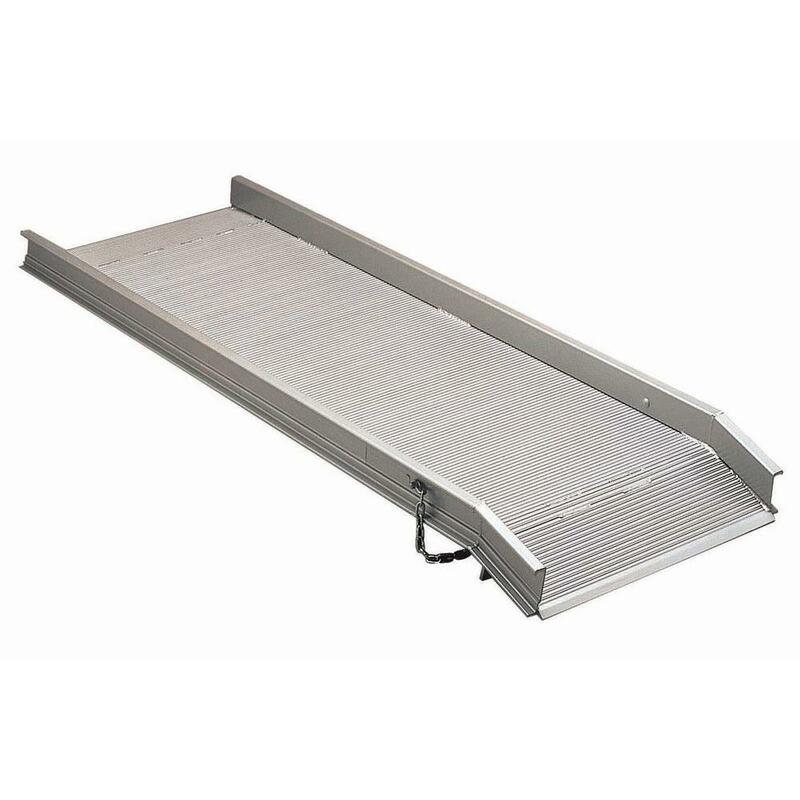 This Magliner Apron Style Van Walk Ramp features a 72" long x 26-1/4" wide usable deck with a 2800 lb capacity, it can service a maximum 21" height differential. The strong but lightweight interlocking aluminum construction assures that the ramps are easily portable from in and out of your truck. The deck is designed with twin-tooth grooves, ensuring better traction, in both directions, whether you are going up or down. Made with your safety in mind, 8" apron, 3-1/4" position stop, and includes 36" long safety chains, to prevent your ramp from slipping out and keeping it where it needs to be. These ramp are made right here in the USA, and usually ship out within 5 days. Please Note: Magliner walk ramps are designed only to be used with two wheel hand trucks, they are not intended for wheelchairs, pallet jacks, or powered equipment.